Couldn’t resist any longer, waiting for the stem to turn brown. I found another info source that said the test was when the bottom of the melon, the side that lays on the ground, is yellow. That was more important or indicative than the brown stem. So I picked the biggest one and cut it in half – half for us, half for George and Barbara. The melon weighed at least 20 pounds so that was plenty for all of us. We gave it a little taste test and it passed with flying colors. Barbara confessed that she had bought a seeded variety very early in the season and had pitched the carcass etc in the compost pile. 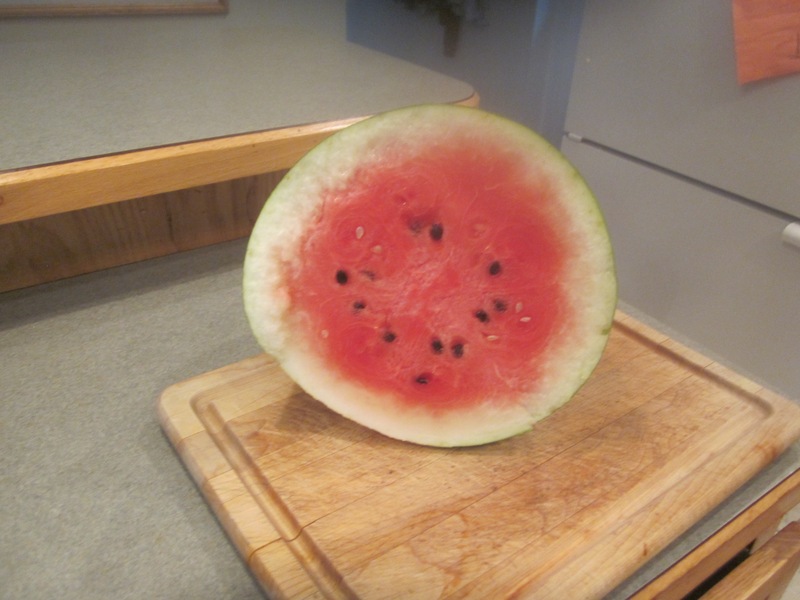 I’m fairly sure we only bought seedless watermelon this year so her seeds were probably the parents. I estimate there are at least 10 more that will be ready to harvest this month. No telling how many small ones are hiding in the lush foliage but the vine is still producing loads of blossoms and keeping quite a few bees busy so maybe we’ll have watermelon for Halloween and Thanksgiving instead of pumpkins. Also, I have another runaway renegade crop in the making. Last year I planted some New Zealand Spinach/aka Tetragonia. I’d tried to grow this plant several times because it promised to survive high temps and provide a source of greens all summer long but with zero success. For whatever reasons, last season it took off and grew prodigiously before eventually dying off with the onset of summer. At the height of it’s growth, I was providing several large bags of greens a week to Nancy’s bridge friends and using it in my green smoothies. Well, I guess it self seeded at the end and has started sprouting a new crop. I’ll get on it much sooner as far as bringing it to table but I can already see by the number of plants sprouting and the size of those that popped up last month, that it has the potential of totally taking over a large portion of the garden. I’m seeing a trend that says crops that pop up on their own without my TLC, do better than those I nurse along from purchased seeds. I guess that makes sense when you think how well weeds do as compared to fancy grass. One thing I plan to do this fall is fight the bugs from the get go using a sprayed on soap solution. Everything I read says that should work and doesn’t count as chemical warfare. I’m using Dawn as the super agent. Nancy uses that on dishes so it must be good. I’ve tried this half heartedly in the past, usually after the bugs have found the crop and started feasting. This season I’m going to get ahead of it and start spraying weekly as soon as the seeds germinate and before any signs of critters. My major focus will be on the squash, beans, and cucumbers which seem to be high on the list of desirable meals for the bugs. Hermine was truly a non-event for us. Over the three day period when it was in our “vicinity” we had 3” cumulative in the rain gauge. For us that’s not even a good thunderstorm total. We were concerned that our labor day party would be a washout but it came off without a hitch. I think the total head count was 20. I have about 18 seedlings, a combination of green peppers and tomatoes, nearly ready for the garden but I’m going to hold off as long as possible. It’s just too hot and dry to try to do the transplant – always a chancy operation. That plus the fact that there is a hurricane like storm heading in this general direction. It’s too far away to accurately predict but if I put the seedlings in, that will be a storm magnet for sure. I hope to plant half a dozen tomatoes plus pole beans and summer squash right after Labor Day. That is if I can find room in the watermelon patch. Pulled out the sweet potatoes – disappointing crop. Got a few edible tubers but considering the rigorous growth of the vine, I had expected a much larger crop. I did get about half a load of material for the compost pile so it wasn’t a total loss. I think we’re a few days from the first watermelon harvest. The stems connecting the melon to the vine are starting to turn brown which I believe is the signal. The field of melons is loaded with honey bees and I keep spotting more tiny melons so this season could go on for quite a long while. Right now the total of large melons that I can see is 10. I was hoping to highlight the party with a home grown melon or two but they’re not quite ready. Big week on the construction project – installed all the door frames, completed all the external foam sheeting, and installed the concrete siding on three sides so the exterior is essentially complete. The last side is mostly sliding glass doors so not much work to finish those when the time is right. I was afraid the hurricane would slow us down but that turned out to be a large yawn. We had several nice overcast days which made for a cool working environment. The foam sheeting is aluminum clad so when it’s sunny, the heat is magnified such that you can really only work on the shady side – a moving target. Next job is building the inside stairwell. Before that, the only way to get upstairs is via the outside stairs. Joe 1, kidney stone/jagged boulder 0. No rematches please.